Okay, I admit it! There’s actually no picture of Toshogu Shrine (東照宮) itself here. 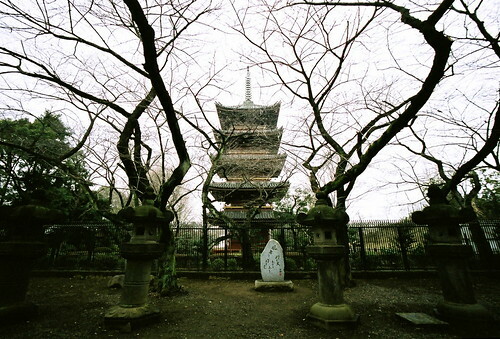 But there is this lovely picture of the Kanei-ji pagoda taken from the shrine grounds. In fact, the main shrine building is quite beautiful, but it was being very unphotogenic on this rainy, gloomy day. Toshogu is a shrine dedicated to Tokugawa Ieyasu, founder of the Tokugawa Shogunate. It was established in 1627 and, since it avoided being bombed during the war, is one of the few original Edo period structures still standing in Tokyo. 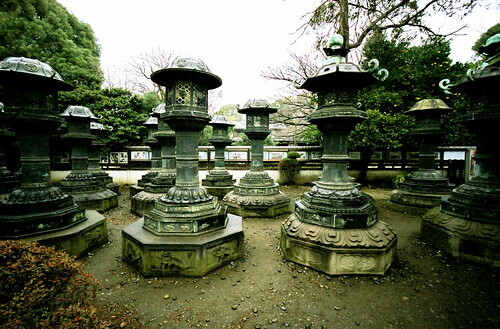 Some of the 200 stone lanterns donated to the shrine by daimyo (feudal lords) during the Edo period. In 1988, a flame was taken from the torch and was merged with another flame lit by the friction of broken roofing tiles of Nagasaki. Along with 30 million signatures collected in support of the ‘Appeal from Hiroshima and Nagasaki,’ it was carried to the third Special Session of the UN General Assembly for Disarmament taking place in New York City. 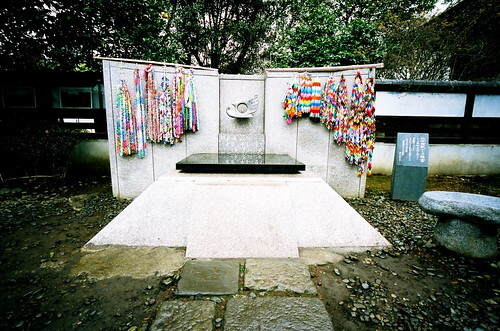 In April the same year, members of “Shitamachi People Association” put forward an idea of lighting the flame at the precinct of Ueno Toshogu Shrine in Tokyo. Rev. Shozen Saga, the chief priest, warmly welcomed the proposal, and promised to set up a monument and work together to keep the flame burning. 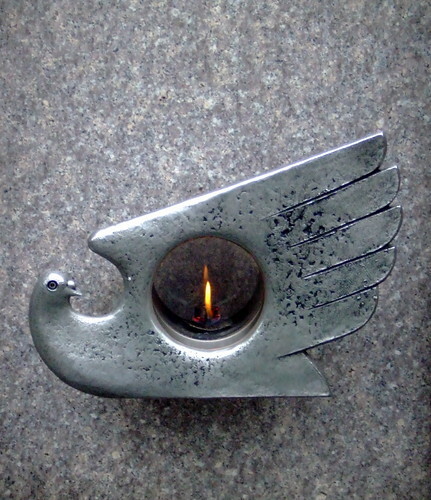 In April 1989, an ‘Association for the Flame of Hiroshima & Nagasaki Lit at the Ueno Toshogu” was founded with the people of wide ranging people. Tens of thousands of people took part in the fund-raising for over one year and the construction of the monument was completed on July 21, 1990. In commemoration of the 45th year of the A-bomb tragedies, a flame of Hiroshima was taken from Hoshino-mura and lit at the monument on August 6, and a flame of Nagasaki, generated by the friction of Nagasaki roofing tiles, was also added to the monument. We, hereby pledge to keep burning the A-bomb flame, convinced that this monument should contribute to strengthening the worldwide people’s movement to abolish nuclear weapons and achieve peace, which is the most urgent task for the people across the borders. The dove in the center is flanked by strings composed of thousands of brightly colored paper cranes.